In manufacturing this calculation is easily measured in the increased number of pieces or items produced, but in healthcare measuring hospital productivity is a little tricky, since there are no pieces to count and the number of required patient services varies greatly. In healthcare, productivity is measured by the amount of time available to provide patient care. It’s measured in terms of room and bed availability, patient throughput, etc. which requires increasing access to care givers. So, productivity looks like more time spent at the bedside and staff actually slowing down to provide that care. When Group50 Healthcare conducts a hospital productivity assessment we don’t measure how fast people work or how quickly they complete their daily tasks. Instead we look simply at the actual work they are doing and identify what they should and should not be doing. We carefully assess the work flow processes to define the activities that are being done, who completes those tasks and most importantly we ask if those tasks are needed at all or are they just a form of “hunting, chasing and fetching”. This is where core tools like Value Stream Mapping come into play. Eliminating wait times, improving room turnaround times, bed turnover, readmission rates and average length of stay are all critical productivity process areas. We focus on processes that get in the way of improved patient care. Dr. Don Berwick, former CEO of the Institute for Healthcare Improvement once stated that “50% of the activities performed in the hospital are pure waste”. Group50 Healthcare consultants zero in on that waste and working with the healthcare organization finds solutions that eliminates that wasted time and gives it back to caregivers. The focus at Group50 Healthcare is on the intersection of people, process and technology in these activities and use the KPI’s as the litmus test for our recommendations. 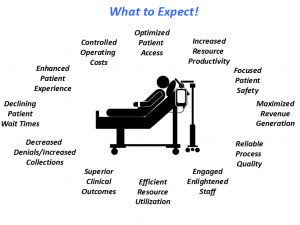 When you work with Group 50 Healthcare, we know that the only way to effectively manage hospital productivity is by improving the processes needed to provide patient care and rooting out activities that don’t have any value and need to be eliminated. Improving productivity is not about anyone going faster, it’s about giving time back to caregivers to be with patients and improve patient outcomes.